Know more about the speakers at the Agos Summit on Disaster Preparedness on July 7-8 at SM Aura's Samsung Hall. Register for limited free tickets today! MANILA, Philippines – The observance of the National Disaster Resilience Month in July is a reminder to everyone of the need to reduce risks and be prepared for disasters. And what better way to learn about disaster preparedness than from the experts and practitioners themselves? 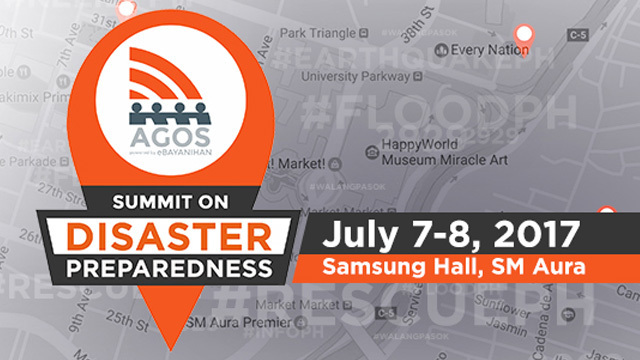 On July 7-8, disaster management experts, responders, policy makers, and volunteers will gather for the first ever Agos Summit on Disaster Preparedness at the Samsung Hall of SM Aura mall in Taguig. The summit aims to bring together key stakeholders, tackle pressing issues, and learn from good practices that mitigated risks or achieved zero casualty. Whether you are a disaster management professional, a government information officer, a business person, or a concerned citizen who is interested in learning about disaster preparedness, this summit is for you. Tickets to the summit are free but MovePH - Rappler’s civic engagement arm - will be accepting voluntary contributions at the entrance which will benefit the continuing development of the Agos eBayanihan platform. Agos facilitates the open sharing of critical information using social media, technology, and crowdsourcing. It is powered by Ateneo de Manila University’s eBayanihan platform. For those living outside Metro Manila, the summit will be livestreamed on Rappler.com. Join the #ZeroCasualty Community on Facebook to get the latest updates and behind the scenes stories from the summit. Day 1 of the summit begins at 10 am, highlighting the experience of the #NowPH (Not on Our Watch - Philippines) movement, which was led by the Climate Change Commission (CCC) and the National Youth Commission (NYC). The initiative pushed for climate action, gathering nearly 3.6 million voices of support that were heard at the historic climate change conference in Paris in 2015. Invited speakers for this session include NowPH convenors: CCC Vice Chair Vernice Victorio, NYC Commissioner Paul Pangilinan, and YesPinoy Foundation founder Dingdong Dantes. The second day of the program covers a broad range of topics and features a variety of thought leaders and experts. The day begins with a discussion on how we can help vulnerable communities adapt to climate change and its effects. Invited speakers include disaster preparedness and climate action champions Senator Loren Legarda, Albay 2nd District Representative Joey Salceda, and Secretary Vernice Victorio of the CCC. After every disaster, ensuring that life goes on and businesses return to normal is critical for post-disaster recovery. The second session of Day 2 will discuss how business continuity is part of community resilience and will include speakers from the Philippine Disaster Resiliency Foundation (PDRF) and Smart Communications. Disaster preparedness is not just the government’s responsibility. We all have a part to play. Session 3 of Day 2 will tackle the role of civic action in disaster preparedness, response, and recovery. Keynoting the session is Senator Richard Gordon who also chairs the Philippine Red Cross. Other speakers include Oxfam in the Philippines head Daniel Sinnathamby and Catholic Bishops' Conference of the Philippines-National Secretariat for Social Action (CBCP-NASSA) head Father Edwin Gariguez. Session 4 will focus on how we can better localize disaster preparedness so that every community and local government takes full ownership of the planning, management, and recovery from a disaster. Undersecretary Ricardo Jalad, the current executive director of the National Disaster Risk Reduction and Management Council (NDRRMC) and OCD administrator, headlines the session alongside Department of the Interior and Local Government (DILG) undersecretary Austere Panadero. The final session of the day tackles the challenges that lie ahead and how education is the key to meeting these challenges. The Department of Education's (DepEd) Director Ronilda Co will talk about how disaster preparedness can be mainstreamed in the classroom. Other speakers include UP Resiliency Institute head Mahar Lagmay and Assistant Director Tetsuya Koide from the Japan Foundation. Wrapping up the day’s talks will be Department of Science and Technology (DOST) undersecretary for disaster preparedness Dr Renato Solidum. Outside the Samsung Hall, Agos partners will have booths displaying the latest gear for your Go Bags and other informative exhibits. There will also be a demonstration on how to create a solar lamp by the Liter of Light Foundation. The XChange Fair is open to the public.